Lost in Time | "What happened to Claw Carver?" Cautiously the party negotiates the narrow staircase, which makes a bewildering multiplicity of twists and turns as it descends for over three hundred feet into the heart of the hill. Eventually the party emerges into a chamber soundly constructed of granite blocks with a level floor. The ranger Yreorraent recognises the handiwork of his Dúnedain forefathers. To one side, a ten-foot-wide corridor disappears into darkness. The party proceeds with Chuffles and Cormac leading the way, Yreorraent and Calum in the second rank, and Finglas and Donald bringing up the rear. Weirdly, the darkness fails to recede before their torchlight, and after thirty feet or so they find themselves faced with a wall of utter blackness. Experimentation proves that they can enter and leave the lightless space. They can even thrust the burning torch within, but beyond the black veil its light is extinguished. Yreorraent remembers that among his possessions is a scroll bearing two spells, one of which might prove useful now. He readies a spare torch and intones the charm. A magical luminescence springs forth from the torch, seems almost to hesitate when it encounters the uncanny darkness, then rallies and expands, shedding a wan light into the chamber beyond. Even though they can’t see farther than thirty feet, the party can tell from the echoes of their hushed voices and cautious footsteps that the room is very large and high-ceilinged. Consulting the floorplans of the fortress that they found in Tir-barad Tereg, they decide they have entered an area marked Fuintir – “Darkwatch”. They hug the left-hand wall and advance slowly, the darkness pressing against their little bubble of light. After about thirty feet, they reach a corner and continue along the wall in the new direction (north, if they are correct about the map). A few steps farther and they become aware of a looming stone shape to their right: seemingly a huge hexagonal column, about twenty feet across, ten feet from the wall they are following. They move over to investigate, whereupon a many-legged shape drops suddenly from the darkness and lunges at Chuffles, huge fangs adrip with venom. Chuffles gasps, hurls himself backwards and evades the beast’s slavering maw. Two more spiders pounce into the circle of light and attack the party. COMING IN PART 5: Orcses! The party decides on a new plan: they will explore Tir-barad Tereg, the watchtower atop Cameth Brin, and attempt to find the reputed secret stair down into the fortress proper. Under a heavy overcast they cross the foaming Sruth Boghain and trek the few miles to the hill, all the while keeping an eye out for any orcs or other creatures abroad on this dull grey day. The countryside seems deserted. They slog up the east slope of the hill to where the impressive tower, over 200 feet in height, perches right at the edge of Cameth Brin’s seemingly impossible granite overhang. A main door at first-floor level is inaccessible now, the original wooden stairs having been gone for centuries, but the party finds a small sally port. The steel-reinforced oak door is still strong, but the party breaks into the base of the tower with little difficulty. Donald’s torch illuminates the interior, which is chilly and thick with dust. Finding a spiral staircase, the party ascends to the floors above. They pass through a kitchen and refectory, stores and guardrooms aplenty, all long deserted. On an upper level, they enter a relatively grand chamber with a door leading to a balcony with a spectacular view. Finglas surveys the countryside around, looking for any sign of threat. Some black specks that must be crows flap around a distant patch of woodland, but otherwise the Trollshaws lie still and silent under the leaden sky. On a dusty table in the next room lies an ancient tome. When wiped clean, words are revealed on the cover: Book of Plans of Cameth Brin. The maps within have suffered the ravages of time and vermin and are barely legible in parts. Nevertheless, this is a notable find. Poring over the pages, the adventurers find plans of the tower itself – with what appears to be a hidden staircase marked on the base level. They resolve to go back down and search for secret doors, but first they ascend the last few steps to the tower’s roof. A windy parapet surrounds the conical tin-plated roof, affording panoramic views – and a dizzying 700-foot drop on the western side. A small door leads into the dark space under the roof, and the party enters. Chuffles finds a rusty mechanism that creaks and complains but serves to open up a section of the roof. Grey daylight seeps in, illuminating the circular floor of smooth black granite inlaid with irregular patterns of seven-pointed copper stars. Perhaps the room was an observatory. Chuffles sets about poking and pressing the stars to see if any are loose. When he reaches the constellation of Menelvagor (identified by Finglas), there is a soft click and a star springs up on the end of a six-inch copper rod. Chuffles grabs hold and pulls, whereupon tiny whirling blades spring from the handle and the hobbit releases the rod with a yelp of surprise and pain. His fingers are cut and bleeding, but the wound is not grave. After bandages are applied, and with a mite more caution, he tries turning the handle instead of pulling. Another soft click, and a hitherto unseen compartment opens in the floor nearby. Inside the shallow space is a long copper box, which proves to contain a wand. Finglas takes it, studies its slim shape and tries to discern its function. It seems to direct his attention to the handle that hurt Chuffles. “I think this detects traps,” he announces. Taking wand and box, the party leaves the roof and descends to the base of the tower. In the room where their map shows a staircase behind – or rather within – a wall, they search for a secret door and Finglas finds it easily. He performs the procedure to open it but suddenly a trapdoor gapes beneath his feet. He totters on the brink but somehow manages to scramble back to safety. Yreorraent looks down the hole and sees daylight. The smooth-sided shaft passes straight through the rock of the overhang, leading to empty air and – five hundred feet below – the gabled roofs and hard, stony streets of the abandoned barracks-settlement of Tanoth Brin. A couple of tiny distant raven-shapes coast lazily across the space framed by the shaft. COMING IN PART 4: The Fuintir. Yreorraent creeps to the chimney hole and looks down it, trying to keep the smoke from getting in his eyes and lungs. It’s filled with smoke, of course, and it seems to twist and turn – after all, trolls wouldn’t risk sunlight shining into their nice dark hole – so he can’t see anything down there. It’s too tight to climb down, too. Maybe a hobbit would fit, but the party doesn’t have a hobbit. Yreorraent listens. From down below comes the intermittent sound of voices like rumbling rocks. Definitely trolls. The ranger reports his findings to the others. Finglas reckons there will be three trolls in the lair, because “that’s standard”. (Sad to say, Finglas is not the wisest of elves.) They hatch a plan to block the chimney hole with stones and earth, heather and grass, hoping to smoke the trolls out into the sunshine. It doesn’t work. Trolls are stupid but not suicidally so. Great coughs are heard from within the cave, and shouts of consternation. The huge boulder suddenly moves scrapingly aside – but only six inches or so, enough to let out a plume of smoke. Then all is quiet again. A futher plan is concocted. Yreorraent, Pingle and Fergus will take positions up the slope from the chimney hole. There are rock outcrops aplenty to provide cover. Meanwhile, Finglas and the remaining Dunlendings will hide where they can watch the cave entrance. The idea is to wait until the sun goes down, hoping that the trolls will come out to investigate the chimney blockage. Those upslope will fire missiles at them, trying to stay out of reach and draw the trolls away while Finglas and the others gain access to the cave. They wait for dusk. Once, Finglas thinks he hears a faint, far sound coming from the cave, like the howling of a beast – or a man – undergoing some cruel torment. The elf listens grimly. After a while, the sound stops and is heard no more. This time, the plan is partially successful. Sure enough, as the sun slips behind the western horizon, there is a great scraping sound and Finglas sees the boulder roll aside. Three hill-trolls emerge in the gloaming. Unfortunately a fourth troll, only partly glimpsed in the shadow of the cave mouth, rolls the boulder back into place behind them. Warily, the trio outside sniff the air and look around. The biggest, a great brute nearly twelve feet tall, grunts, “Freg. Go an’ ‘ave a butchers at the smoke ‘ole.” Freg stomps up the slope to have a look, whereupon ranger and fighter fire arrows at him and Fergus hurls his throwing club. None scores a hit, but one of the arrows whistles past the troll’s ear and he shouts, “Dad! There’s someone ‘ere!” All the trolls charge up the slope. A running battle commences. Our heroes fall back up the slope with the trolls after them. Freg takes a couple of arrows in leg and shoulder. Unfortunately, in the gathering darkness, the retreating men stumble over the uneven ground and slip on loose stones. The trolls, though relatively slow and lumbering, know this hillside intimately (and can see perfectly well in the dark) and manage to close the gap. The bold Fergus yells and aims a spear thrust at Freg’s belly. He misses, and Freg crushes him with his huge club. Pingle Rack, having dropped his bow and unsheathed his two-handed sword, is likewise slain in short order. Yreorraent is badly wounded, but manages to scramble away again and stay a step ahead of the advancing trolls, firing at Freg whenever he can. Freg, smarter than the average hill-troll, realises he can’t catch the irritating man, and throws a rock at him instead, landing a glancing, stinging blow on Yreorraent’s elbow. Meanwhile down below, the elf Finglas has divested himself of his encumbering plate armour. Now he hurries up the slope and starts firing at the backs of the trolls. The unfortunate Freg is pincushioned with arrows from above and below and eventually falls dead among the rocks. Bellowing with rage, the huge troll patriarch turns and charges back down the slope towards the new assailant. At this point, our heroes admit defeat. Finglas yells, “Retreat!” and the remnants of the party take to their heels, scampering down the hillside and away, with trollish shouts and imprecations ringing in their ears and the occasional rock flying past their heads. COMING IN PART 3: Tir-barad Tereg. At the weekend my friends and I convened for our first gaming session in six months. 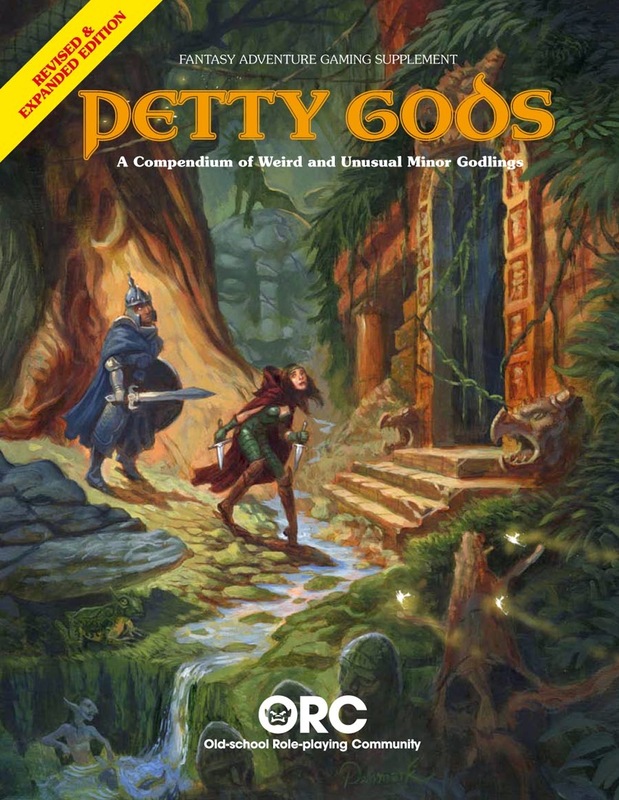 I served something I’ve been cooking up for a while: an adventure set in Middle-earth, based on material in one of the old MERP modules from Iron Crown Enterprises, remixed and tweaked for use with Swords & Wizardry Core Rules with classes taken from Mike Davison’s wonderful Drums in the Deep supplement. At the Red Hooves Inn, the only hostelry in town, they hire three local Dunnish men-at-arms, somewhat surly and interchangeable, called Cormac, Fergus and Donald. Yreorraent and Pingle buy several rounds of drinks to loosen tongues, and learn a few things: (1) The valleys around here are reputed to be haunted by the ghosts of long-dead Hillmen. (2) According to legend, a Hillman bandit long ago hid his plundered wealth in a cave somewhere east of Cameth Brin. Some say the cave connects with the lowest levels of the fortress. (3) There is also supposed to be a secret way into Cameth Brin from Tir-barad Tereg, the watchtower atop the Twisted Hill. And finally (4), they hear that a fierce and capable-looking Dunnish warrior (no one caught his name, or if they did they don’t remember it) left town a week ago, heading for Cameth Brin. He has not been seen since. COMING IN PART 2: The best laid schemes o’ elves an’ men gang aft agley. What do monsters do all day? You know, while they’re waiting for foolhardy adventurers to come clanking down the stairs with their torches and poles and oh-so-tasty retainers? Depending on your level of Gygaxian-ness (Gygaxianity? Gygaxiosity? 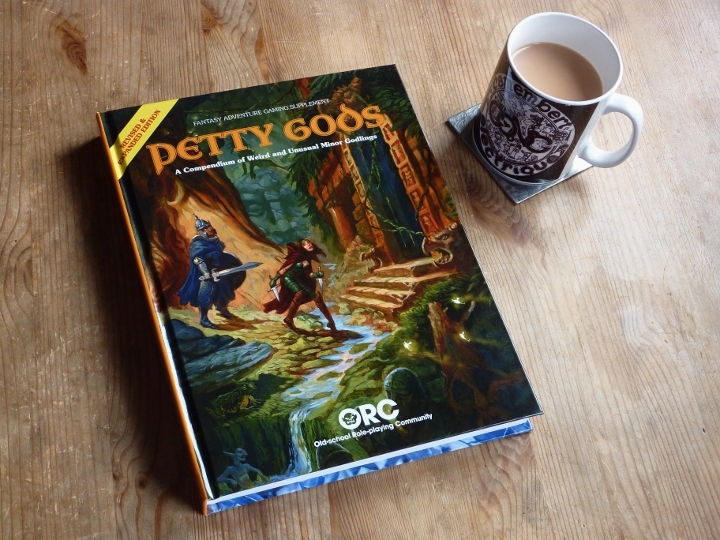 ), your dungeon-dwelling kobolds and gnolls and ogres and whatnot might be standing guard, sleeping, drinking grog, playing dice games, sharpening their halberds or adding a pinch of snot to the giant rat stew. Or, if you favour the mythic underworld paradigm, perhaps your monsters are just lurking in some kind of folktale limbo: not sleeping, not eating, not really being – but waiting to boil up from the collective unconscious, assume corporeal form, and inflict several dice of damage on those pesky PCs. Anyway, that’s all slightly beside my point. Yes, there is a point. I’ll get to it in a minute. Furthermore, there are several subtables, including one that furnishes some encountered creatures with “missions”: things like trade, transport, rescue, etc. Here’s the point (I told you there was one): I decided to make an expanded mission table for wandering monsters in D&D-style games. Zombies and gelatinous cubes won’t be on missions. (The perennial urge to kill and/or eat adventurers is not a mission as such; it’s maybe more of a vocation.) Nor, in all likelihood, will creatures encountered in or near their lairs. Quotidian activities like hunting or patrolling the corridors don’t count. However, intelligent monsters encountered in the wilderness or wandering in dungeons without a lair nearby might well be on a mission. (Otherwise, what are they doing? Unless they’re just lost.) If the Referee rolls up an encounter with some orcs, say, and isn’t sure what they’re up to, she can roll 1d20 and consult the table below. Some of the results are pretty vague. That’s deliberate; they raise more questions and require some fleshing out. Some results overlap slightly. That’s inevitable. I have neither the time nor the inclination to make a d1000 table covering every little detail, and you wouldn’t use it if I did. Loose though it is, this little table is intended to enliven encounters and create roleplaying opportunities. I hope it’s useful to someone somewhere (in summertime, possibly). Assassination – They are on their way to kill a specific person. Who? Why? Capture – They are on their way to capture an animal or person. Are they kidnappers? Bounty hunters? Animal trainers? Vermin wranglers looking for poisonous pets? Collecting – They are in this area to find rare herbs, minerals, eggs, magical ingredients, etc. Crime – They are in the process of committing a criminal act. They might be highwaymen, burglars, smugglers, poachers, pickpockets, con-men, arsonists, vandals, investment bankers, etc. Entertainment – They are travelling minstrels, or thespians, or circus performers, etc., on the way to their next engagement. Either that or they are eager punters travelling to a festival, exhibition, sporting engagement, or other similar event. Geas/Quest – They are under magical compulsion to go somewhere and do something. If nothing springs to mind, rolling again on this table might suggest the nature of the quest. Mission/Crusade – They’re on a mission from their god to convert unbelievers or destroy the infidels. Personal – This could be anything: looking for a new home, seeking employment or enlightenment, on holiday, craving romance or adventure, or a hundred other things. See, I told you some results were vague. Pilgrimage – They are travelling to a site of religious importance. Politics – They are ambassadors from one faction, tribe, or other organisation to another. They might bear documents, seals, or other means of identification. They might also be carrying appropriate gifts or tribute. Their mission might be secret. Reconnaissance – They are keeping tabs on the size and status of neighbours and/or foes, spying out sentries, traps, etc., and looking for defensive weaknesses. Is conflict brewing? Retrieval – They are on their way to recover a lost or stolen object (or objects) of some kind. Refugees – Not strictly a “mission”; they are fleeing some enemy or natural disaster. What happened? Where are they going? Are they pursued? Rescue – They are on their way to aid a member of their group who has got lost, been abducted, or is in some other kind of trouble. Research – They are out looking for information of some kind. Perhaps they are willing and able to pay for it. Perhaps they don’t want anyone else to know it, whatever it is. Revenge – They seek redress (probably of the violent kind) for some wrong committed against them (or their relatives or friends). They are most likely well-armed and armoured. Trade – They are merchants, with goods to trade. Add 1d3 pack animals, plus 1d6 guards, or more if the goods are especially valuable, large or numerous. Transport – They are couriers, on their way to deliver something somewhere, or returning after having delivered it. Add 1d6 guards, or more if the cargo is/was especially valuable. Treasure Hunt – They’re after a particular treasure. Maybe they’ve heard rumours of its location, or are in possession of a map. They are unlikely to share such information with adventurers unless they need help achieving their goal. I count at least 27 gameable elements in this video. The postie tried to deliver this yesterday, but it wouldn’t fit through my letterbox (you can see why!) so I had to go and collect it from the sorting office this morning. Unfortunately then I had to go to work, so I’ve only had time to glance through the pages, but what I’ve seen so far is pretty bloomin’ marvellous. After all these years, it is a treat to behold Petty Gods in the flesh, as it were. I will have more to say anon. Remember, you can get a copy (hardback, paperback or FREE PDF) from one of the links here. In case you haven’t already heard, after a long and fitful series of events and processes – conception, gestation, stagnation, revivification, presentation (as Original Petty Gods), revision and expansion – Petty Gods is now available in hardback or paperback formats (at cost) or as a PDF (absolutely free)! 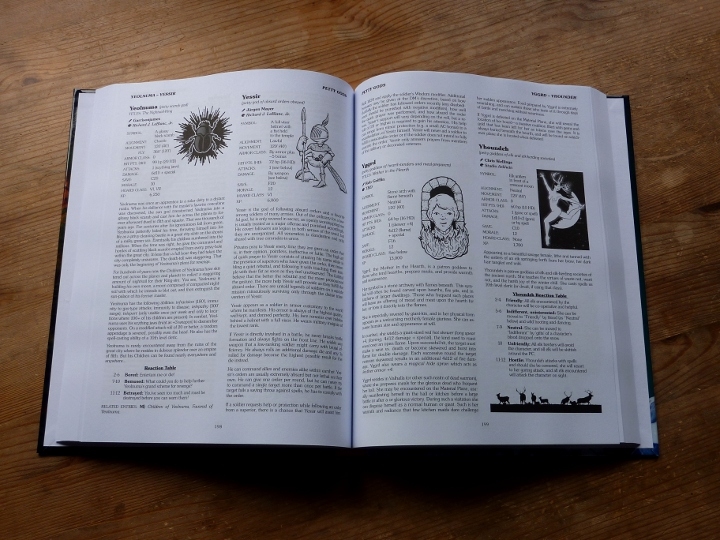 This thing is almost 400 pages long, and those pages are stuffed to the gunwales with godlings, minions and servitors, divine items, spells and, er, foodstuffs (black death pudding, anyone?) to weird up your old-school fantasy RPG of choice. Doubtless I’ll have more to say when my hardback copy arrives and I can read this thing properly. (I’m not a fan of PDFs, although when they’re free I certainly don’t complain.) Meanwhile, hats aloft if you will to Blair Fitzpatrick, James Maliszewski, Peter Gifford, Greg Gorgonmilk, Matthew W. Schmeer and Richard J. LeBlanc, Jr., whose ideas and (appropriately herculean) efforts have brought forth this behemoth from the combined imaginations of the old-school role-playing community, much as the Greek gods split open the braincase of Zeus to bring forth Athena. Or something.